The project is sponsored by MillerCoors, Momentum Recycling and Rehrig Pacific Company who supplied all of the 96 gallon carts. Alpine Waste & Recycling, Republic Services and Certifiably Green Denver provided additional support. A six-month glass collection pilot project coordinated by Recycle Colorado will increase the collection of glass bottles in downtown Denver. 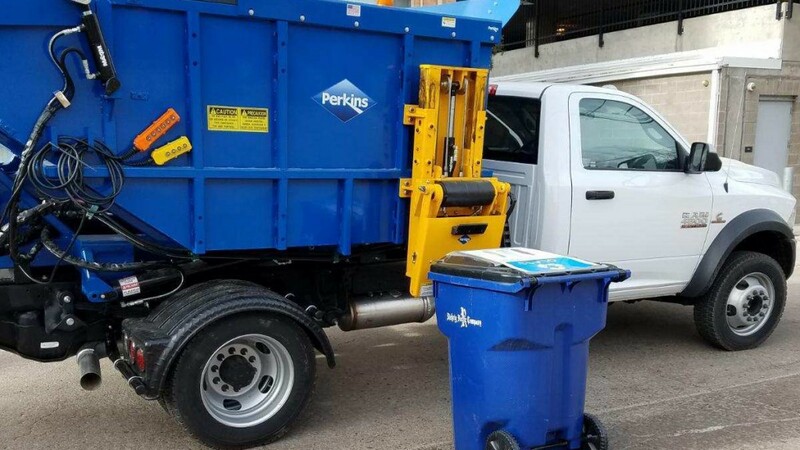 The project provides 96-gallon recycling carts to participating businesses and arranges for glass collection services through May 2019. Businesses can participate for free. According to Recycle Colorado, glass is a commodity with end markets in the state, unlike other materials that may have to be shipped out of state. In this closed-loop system, post-consumer glass is collected, sorted and made into new products such as bottles. For Colorado's closed-loop system to work properly, the organization says they need to collect more glass. The organization also states that i takes only a few weeks to remanufacture 100 percent of recycled glass into new bottles in Colorado -but first the glass must be collected. Currently, less than 30 percent of the total glass in the waste stream is captured for recycling, and keeping glass in a closed-loop system and out of the landfill benefits Colorado both environmentally and economically. One ton of recycled glass saves 42 kilowatt hours of energy, and recycling creates an average of 10 times more jobs than sending material to landfill. Businesses in the Greater Denver areas of South Broadway, Colfax east and west, and Downtown Denver neighborhoods are being invited to participate. During the collection portion of the project, outreach teams will provide support and address any issues or concerns that arise. At the end of the project, participants can choose to continue to work with a service provider or return their recycling cart. The project is sponsored by MillerCoors, Momentum Recycling and Rehrig Pacific Company who supplied all of the 96 gallon carts. Alpine Waste & Recycling, Republic Services and Certifiably GreenDenver provided additional support. Cornerstone Apartments has also involved 18 of its multifamily unit buildings in the pilot as a program partner to help support recycling. The local Baker Historic neighborhood residents who do not have single-stream recycling service are also able to participate by taking their glass to the Sinclair gas station at 295 South Broadway in Denver. Recycle Colorado is the leading independent, non-profit organization in Colorado, actively working to advance infrastructure, end markets and state and local policies so that Colorado's waste stream is recycled, composted or diverted to reuse or remanufacturing. For more information about RecycleColorado visit www.recyclecolorado.org. TOMRA Sorting Recycling has introduced AUTOSORT COLOR, a new machine which works in combination with AUTOSORT LASER to separate glass from municipal solid waste (MSW) with unprecedented effectiveness. Even though it is common to collect glass waste separately, a significant amount of recoverable glass remains mixed-in with MSW from households and businesses. AUTOSORT COLOR achieves purity rates greater than 95% at high throughput rates, even when input materials are wet, dusty or dirty. According to a June blog post from Ontario-based CIF (Continuous Improvement Fund), which funds and supports blue box recycling projects and research in the province, the marketplace for municipal grade mixed broken glass is relatively thin. At the same time, quality specifications from end markets are becoming tighter, requiring added attention by MRF operators. CDEnviro has recently appointed a new Business Development Manager for North America. Based in North Carolina, Alan Mitchell, will lead the team that is responsible for business development across the whole of the US and Canada. Recycling Product News recently had the opportunity to ask a series of questions about the factors behind scrap glass market prices, and the nature of scrap glass as a recycled commodity, to Pierre-André Mongeon, Machinex's glass recycling solution specialist and an active member of the Glass Recycling Coalition (GRC). In October, Veolia announced the expansion of its electronics and lamp recycling capabilities in Canada with the opening of a new, 5,000 square foot, state-of-the-art recycling facility located in Pickering, Ontario (Greater Toronto Area). While the plant's primary purpose is to provide lamp-recycling services for customers across Ontario and other Canadian provinces, other electronics and mercury-bearing wastes can also be handled for customers out of this facility as appropriate. Veolia currently also provides industrial cleaning and hazardous materials management services from this location. Machinex completed a major modernization last month at the Récupération Mauricie sorting facility, located near Trois-Rivières, Quebec. The sorting system now has increased efficiency and higher quality sorted material. Beautiful St. Barthélemy in the French Caribbean hosts over 200,000 visitors every year. This creates a significant amount of used glass (mostly glass beverage containers) which needs to be managed. In July of 2017 St. Barthélemy followed the example of several nearby islands and installed an Andela Glass Pulverizer to transform dirty, bulky and expensive-to-ship glass bottle waste into clean reusable aggregate. Using the Andela GPT-1HD Glass Pulverizer System, St. Bart's can now process 3 to 5 tons per hour of glass bottle waste. Plessisville, QC - The Executive Committee of Ville de Montreal has granted, on September 22nd, a contract to La Compagnie de recyclage de papiers MD Inc. This contract allows the design, construction, operation and maintenance of the new recycling plant located in Lachine. Machinex has been selected by La Compagnie de recyclage de papiers MD to provide this new system, projected to be fully operational in fall 2019. Today's eddy current separator (ECS) technology is ideal for scrap recyclers, MRFs and other recycling facilities that want to automate recovery of nonferrous metals (after ferrous recovery) from MSW, sand, glass, dirt, CTD, electronic scrap, shredded automobiles and refuse. Canadians generate a lot of waste. On average, every Canadian will generate 720 kg (1,587 lbs.) of waste that goes to landfill, which is equal weight to a full grown female giraffe. In the spirit of Waste Reduction Week in Canada here are ten easy take-action tips that will reduce our reliance on landfills and help you adopt more environmentally conscious choices. Éco Entreprises Québec (EEQ) recently announced they will provide Ville de Montréal with a complete leading-edge glass sorting and cleaning system, as part of the construction of a new sorting centre in Lachine. This three million dollar investment will contribute to the optimization and performance of selective collection in the region. TOMRA Sorting Recycling has announced the launch of a sensor-based sorting machine based on laser technology. AUTOSORT LASER enables the separation of glass, ceramics, stones, metals and plastics from household and commercial waste. Its capabilities allow material recovery facilities (MRFs) to further fractionalize waste and reduce overall weight for landfill, thereby significantly reducing landfill costs. Moreover, AUTOSORT LASER helps create additional revenue streams through the recovery of salable products. TOMRA's reverse vending solutions for the collection of cans and bottles, has installed its 500th T-90 Reverse Vending Machine (RVM) at Meijer in Cadillac, Michigan. The store now has eight T-90s, providing its customers with fast, clean and efficient container redemption. "Having the 500th installation of our T-90 RVM within a year after the initial launch of the technology in the U.S. is a great accomplishment," said Debbie Hall, SVP Sales, TOMRA of North America, Inc. "This speaks to our advanced technology and demonstrates that fast and efficient RVMs are a necessity as consumer interest in sustainability and redemption continues to increase." Nashville, TN - MSS, Inc., the optical sorter division of CP Group, has introduced MetalMiner, the next generation of induction-based true all-metal detectors. MSS has designed and built induction metal sorters for over 40 years, and this latest iteration was designed specifically to handle auto shredder residue (ASR), electronic scrap, plastic flake and glass cullet applications. One of the most relevant new technical features of the MetalMiner is the patent pending MapLine algorithm. MINNEAPOLIS, MN (August 29, 2017) - Ninety-six percent of residents and consumers expect to be able to recycle glass, according a survey conducted by Glass Recycling Coalition's (GRC) of more than 250 public sector representatives, glass industry professionals, and material recovery facility (MRF) representatives. The glass recycling survey results, released today at the Resource Recycling Conference in Minneapolis, found that the top priorities among public sector respondents for recycling programs are fulfilling resident satisfaction, meeting sustainability goals, and reducing contamination. Toter, a manufacturer of carts and containers for the collection of waste and recycling, introduced the Extreme Tote, a tougher, more durable recycling bin for haulers, in May at Waste Expo. Penn Waste has announced plans to add technology and capacity to the company's 35-ton-per-hour (tph) Single Stream recycling system housed in the company's 96,000-square-foot Manchester, PA Materials Recovery Facility (MRF). Eugene, Oregon-based Bulk Handling Systems (BHS) designed, engineered, manufactured and installed the advanced processing line in 2015, and will provide the $3.5 million retrofit. Expected to be operational in August of this year, the new and improved system will increase throughput to more than 45 tph and improve material purity. Éco Entreprises Québec (ÉEQ) has inaugurated an innovative glass processing equipment as part of the implementation of its Innovative Glass Works plan. The Quebec City Materials Recycling Facility (MRF), which is operated by Société VIA, is among the five centres to receive cutting-edge equipment to lead experimental pilot projects with the aim to find a solution for 100% of the glass collected through curbside recycling. The US based Glass Recycling Coalition (GRC) has announced the release of an online decision-making tool to help recycling program managers evaluate or optimize their glass recycling programs. Developed with the help of GRC members and guidance from the GRC's Government Advisory Council, the decision-making tool is equipped with best practices, interactive data, contract considerations and more. ZenRobotics Ltd. will deliver a robotic waste sorting system to Sunshine Groupe in Melbourne, Australia. The three-armed ZenRobotics Recycler unit (ZRR3) will be the first of it’s kind in Australia and it is expected to be fully operational in spring 2017. The Institute of Scrap Recycling Industries (ISRI) Board of Directors approved the addition of new specifications for glass and inbound mixed recyclables for material recovery facilities (MRF) during its Winter Meeting on February 10. As per ISRI’s Policy Manual, any party may submit to ISRI a written appeal of the ISRI Board’s approval of this new specification up to 30 days after publication of this notice. Written appeals must provide a rationale and a request for action and should be sent to ISRI President Robin Wiener. National Recovery Technologies (NRT) has announced a new addition to the company’s product offering, the ColorPlus-R. Similar to the ColorPlus, the ColorPlus-R uses an advanced image processing system to detect materials based on color analysis and object recognition. Unique to the ColorPlus-R is the ability to color analyze opaque objects, such as black plastics. Light-emitting diode (LED) bulbs last much longer and use less energy than fluorescent lights and are becoming a popular choice for holiday lighting, indoor lights and many other uses. Maria Holuszko, a University of B.C. (UBC) mineral processing engineer and her PhD student Amit Kumar have found a way to make LEDs even more environmentally friendly. They’ve evaluated a process that recovers valuable metals in LEDs and reduces the amount of waste that eventually ends up in landfills. The Institute of Scrap Recycling Industries (ISRI) Board of Directors will consider the addition of new specifications for glass and inbound mixed recyclables for material recovery facilities (MRF) during its Winter Meeting on February 10. ISRI’s Paper and Plastics Divisions recently approved each of the specifications, which are intended to increase understanding of the issues processors face when working with complex streams from municipal program sources. This past America Recycles Day (November 15) and Rumpke Waste & Recycling Dayton celebrated by unveiling a $1 million renovation at one of the U.S.' only mixed glass recycling centers. Éco Entreprises Québec (ÉEQ) has revealed the names of the five sorting centres selected to take part in pilot projects to test cutting-edge cleaning and sorting equipment for glass collected through curbside recycling in Québec, Canada. Under ÉEQ’s Innovative Glass Works Plan, a first in North America, the sorting centres will contribute to the search for a concrete solution for 100% of the glass collected through curbside recycling. In winter 2017, official inaugurations will be held in each sorting centre to mark the installation of the equipment, which represents a total investment of $4.1M US. Operations are underway at the new Emerald Coast Utilities Authority (ECUA) Materials Recovery Facility (MRF) in Pensacola, Florida, processing 25 tons-per-hour (tph) of Single Stream recyclables. Designed, manufactured and installed by Eugene, Oregon-based Bulk Handling Systems (BHS), the recycling system is expected to process 40,000 tons annually. U.S. consumers in deposit states can already redeem their beverage containers for their deposit value, helping to ensure that those materials are recycled. Now, those consumers can earn even greater rewards for redeeming deposit containers, creating incentives that could potentially improve recycling rates across the country. Established in 1988, SARCAN Recycling (SARCAN) was formed as a division of SARC, a company that provides basic education, training and development for people with intellectual disabilities and their supporting agencies, with the primary goal of creating employment opportunities. With a head office in Saskatoon, SARCAN Recycling has over 650 employees and operates 71 recycling depots, as well as processing plants in Saskatoon and Regina. Persons with intellectual disabilities, or those previously on social assistance, make up approximately 70 percent of SARCAN’s workforce. The company’s depots accept primarily non-refillable, one-time-use beverage containers, but do also take standard refillable beer bottles, tin and aluminum cans, plastic containers, tetra and asceptic (polycoat) containers, juice cartons, milk and glass containers, as well as used paint cans and e-waste. Machinex has allied with Krysteline Technologies for the introduction of their unique glass Implosion technology and associated equipment to the North American marketplace. The North American Insulation Manufacturers Association (NAIMA) has announced the results of a recent survey of its U.S. and Canadian members' use of pre- and post-consumer recycled materials in insulation and acoustical products for 2013. NAIMA Canada members used more than 136 million kilograms of recycled material in the production of their mineral fibre products. Republic Services today dedicated the Conover Recycling Facility in Catawba County, which will introduce or expand single-stream recycling capabilities throughout Alamance, Catawba, Guildford, Montgomery, Richmond, and Stanly counties. The expanded, highly-advanced facility – designed, manufactured and installed by Bulk Handling Systems (BHS) – has the capacity to process more than 25 tons of mixed recyclables per hour, or 400 tons each day. Granutech-Saturn Systems, a world-leading manufacturer of industrial and mobile shredders and other recycling equipment announced today it has developed and launched a new hybrid-drive mechanism option for its popular line of Saturn® industrial shredders, available on both new machines and as a retrofit kit for older machines in the field.